Dirk J. Broer is a polymer chemist specialized in polymer structuring and self-organizing polymer networks. This entails the development of polymers with new functionalities and integrating them into devices to meet industrial and societal challenges in the fields of sustainable energy, water-management, healthcare & personal comfort. The research follows the complete chain of knowledge from molecule to device. i.e. from organic synthesis to prototype. Both top-down and bottom-up methods are employed for the preparation of hierarchically structured materials in the fields of Energy Materials, Stimuli-responsive Materials, and Nanostructured Materials. 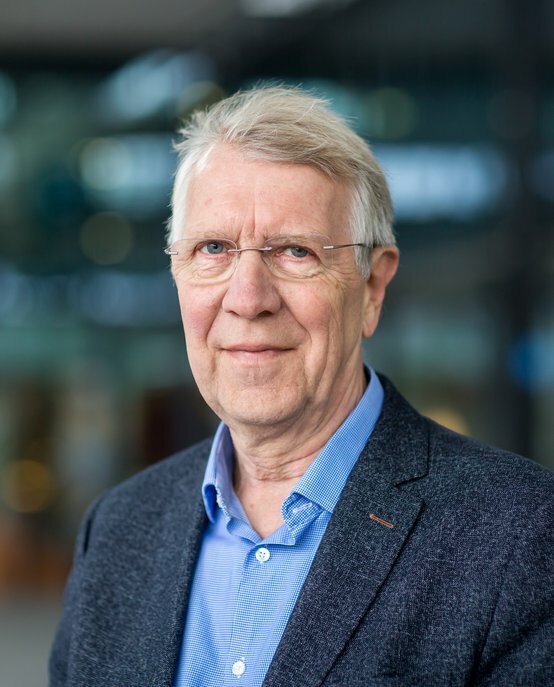 Dirk J. Broer has worked the better part of his career at Philips Research (Eindhoven, Netherlands) which he joined 1973. He worked on a manifold of research topics such as vapor phase polymerization, optical data storage, telecommunication and display optics. In 1990/1991, he worked at DuPont Experimental Station (Delaware, USA) on nonlinear optics and vapor phase deposition of pi-conjugated polymers. In 1990, in line with his Philips research into liquid crystal materials, Broer obtained his PhD degree at Groningen University with his thesis 'In-situ photopolymerization of oriented liquid-crystalline acrylates' supervised by Prof. Ger Challa. He returned to Philips Research in 1991 where he worked, amongst others, on LCD enhancement and new LCD manufacturing technologies. From 2003 to 2010 he was senior research fellow and vice president at the Philips Research Laboratories specializing on biomedical devices and applications of polymeric materials. Broer has been a part-time professor at Eindhoven University of Technology (TU/e) since 1996, covering research topics such as liquid crystals, polymer waveguides, solar energy, organic semiconductors, nanolithography, soft lithography and polymer actuators for biomedical microfluidic systems. In 2010, he was appointed fulltime professor at TU/e to chair the research group Functional Organic Materials and Devices. Since 2010 he is member of the Royal Dutch Academy of Arts and Sciences (KNAW). In 2013 he was appointed Distinguished Professor at South China Normal University, South China Academy of Advanced Optoelectronics, Guangzhou, China.